A great place to prospect for gold in Central Arizona is the Lynx Creek drainage that lies near Prescott, Arizona in the Prescott National Forest. Located in Yavapai County, the creek and its tributaries account for some of the highest placer gold production in the state, with records showing over 100,000 ounces being taken out of this area since the initial discovery of gold here in 1863. Several documented discoveries of gold nuggets weighing several ounces exist, and there is likely to still be a few left to find even today. Gold can vary from good sized nuggets on down to fine gold in the creek itself. One of the great things about this area for gold prospectors is that several miles of Lynx Creek have been withdrawn from mineral claim, meaning that these areas are open to recreational prospecting. The Forest Service does have certain rules in place, including restrictions on mechanical mining equipment such as suction dredges, highbanker, drywashers, and even sluice boxes. The Forest Service considers “recreational use” to be limited to gold panning and metal detecting. Using standard equipment such as picks and shovels are allowed, but they must be used below the high water mark. Any holes that are dug must be filled in before leaving the area. The withdrawn area spans several miles of Lynx Creek, providing a significant area to explore and prospect. For detailed maps of the withdrawn mineral area, contact the Prescott National Forest. It is also advised that you consult them for any recent changes to regulations in the area, since rules may change since the writing of this article. Also be aware that surrounding the public gold prospecting area are many parcels of private property, and many of the surrounding mines in the area are on private land or unpatented mining claims on Forest Service land. Take care to make sure that you are prospecting in an area that is open to you. Metal detecting in this area can be productive. With a history of large gold nuggets being found in Lynx Creek as well as many of its tributaries, a quality gold detector can be a great way to find nuggets. The area is know to have a lot of ferrous trash, so a quality VLF detector with a good discrimination may work well here. The area has certainly been hunted hard over the years, but there is no doubt a few more nice nuggets left in the ground waiting to be found. This region has produced more gold than anywhere else in Arizona. There are also numerous other gold districts that have produced millions of ounces of gold and other precious metals. 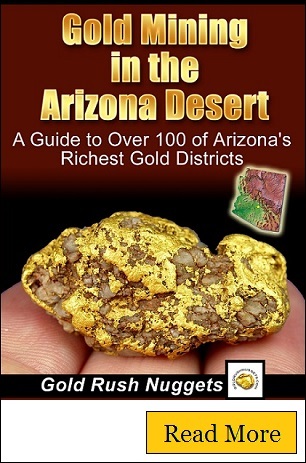 Additional information about gold districts and across the state can be found in this article about gold prospecting in Arizona.